Planar graphs are known to have geometric representations of various types, e.g. as contacts of disks, triangles or - in the bipartite case - vertical and horizontal segments. It is known that such representations can be drawn in linear time, we here wonder whether it is as easy to decide whether a partial representation can be completed to a representation of the whole graph. We show that in each of the cases above, this problem becomes NP-hard. These are the first classes of geometric graphs where extending partial representations is provably harder than recognition, as opposed to e.g. 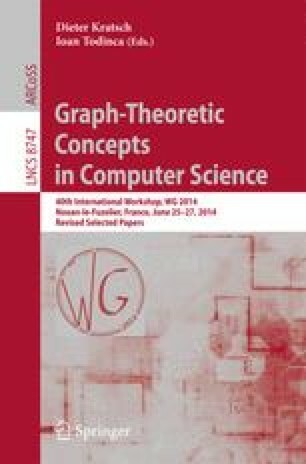 interval graphs, circle graphs, permutation graphs or even standard representations of plane graphs. On the positive side we give two polynomial time algorithms for the grid contact case. The first one is for the case when all vertical segments are pre-represented (note: the problem remains NP-complete when a subset of the vertical segments is specified, even if none of the horizontals are). Secondly, we show that the case when the vertical segments have only their \(x\)-coordinates specified (i.e., they are ordered horizontally) is polynomially equivalent to level planarity, which is known to be solvable in polynomial time. S. Chaplick: Supported by ESF Eurogiga project GraDR. J. Kratochvíl: Supported by GAČR project GA14-14179S and partially by ESF Eurogiga project GraDR as GAČR GIG/11/E023.